President Edgar Lungu’ spokesperson Amos Chanda says Mr Lungu will not attend tomorrow’s dialogue meeting called by the church as he has more important things to do. Earlier, the three mother church bodies convened a meeting of all political party presidents to be held tomorrow. According to the Church mother bodies, the purpose of the meeting is to update the party leaders on the progress the church has made in preparing the national Indaba and reconciliation. But the moment this information was made available, Lungu’s handlers who are against reconciliation went to work. 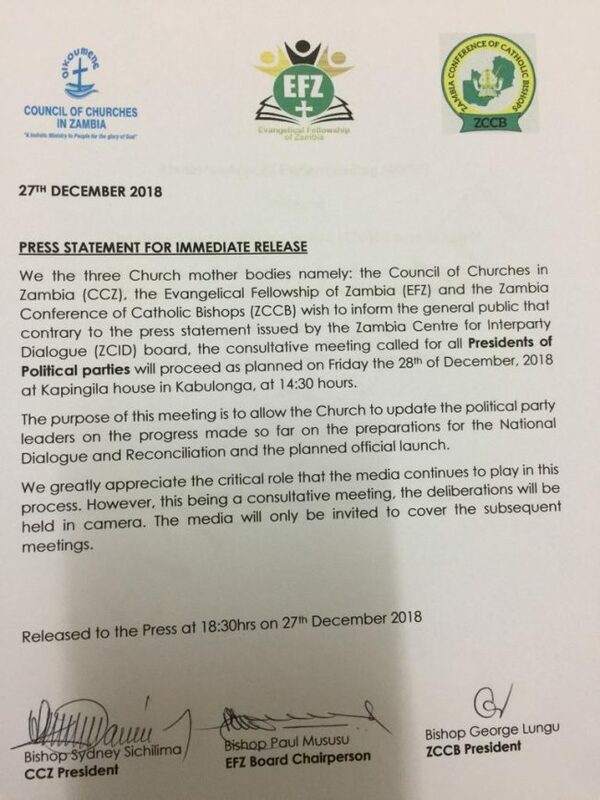 Firstly, without consulting the three mother church bodies, the Zambia Centre for Inter-party Dialogue (ZCOD) issued a statement claiming that the meeting has been postponed. Then PF deputy Media Director Antonio Mwanza issued his own statement describing the meeting as ‘fake news’. 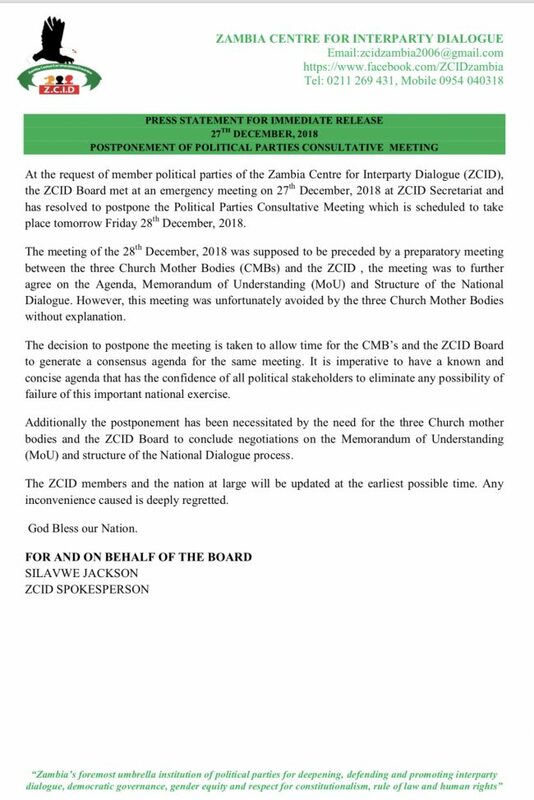 Then the three mother church bodies issued a statement disputing the ZCSID statement and confirmed that the meeting will go ahead. This prompted President Edgar Lungu’s spokesperson Amos Chanda to issue his own statement telling the nation that the church mother bodies are lying and did not invite Lungu. Chanda said Lungu has other important engagements on the copperbelt. The Watchdog is fully informed that the people surrounding Lungu will do anything including killing to make sure there is no reconciliation. The group of thieves surrounding Lungu do not want reconciliation because they are making money from the current animosity, division and hatred in the country. Who can believe that the three church mother bodies convened a meeting but did not invite president Lungu? We have a very strong feeling that the invitational letter was withheld from Lungu. President Lungu must open his eyes and realize that he is being used as pawn by people deriving benefits from a divided nation. At the end of the day, it is Lungu not these parasites who will be judged by posterity. 1. State House has not received any formal invitation to the reported dialogue tomorrow. 2. We have said as a holding position that the President is ready for dialogue any time as per the programme to be set by the Church. Since the two meetings the President held with leaders of the Church mother bodies, there has been no formal invitation and program me from the Church and ZCID. 3. The President has engagements in Kitwe tomorrow afternoon and Saturday morning.